One of the most recognizable weight-lifting exercises, the flat bench press, develops muscles primarily of your chest, arms and shoulders. The amount of weight you can “bench” or “press” is one measure of your overall upper-body strength. This is because of the engagement of the muscles involved in the exercise. Perform a normal or flat bench press by lying back on a flat bench with your feet on the floor and your buttocks resting on the bench. Grasp the bar with an overhand grip, hands placed comfortably wider than the width of your shoulders. Breathing in, lift the barbell from the rack and lower it to your chest. Breathing out, press the weight up until your arms are straight. Repeat as many times as your exercise program dictates. Flat bench presses focus on most of the pectoralis major muscles of the chest. The portion of the pecs closest to the collar bone, the clavicular part of the pecs, receive less of a workout than the rest. Muscles that receive secondary benefits and get a good workout are the anterior and medial deltoids of the shoulder and the triceps at the backs of your arms. Other muscles involved in the flat bench press include those of the rotator cuff, the posterior delts, the rhomboids under the trapezius in your back and the serratus anterior muscles situated in front of the latissimus dorsi. Additionally, the small muscle of the upper arm called the coracobrachialis, located adjacent to the triceps, biceps and lat muscles, get a workout. The secondary muscles involved in the flat bench press are classified as synergists and stabilizers because they assist the primary muscles in lifting the weight. It is the recruitment and participation of these secondary muscles that lead some people to favor lifting free weights over using weight lifting machines, such as the Smith Machine. Lifting and controlling unsecured free weights, such as a barbell in a flat bench press, benefits more than just the primary muscles that provide the bulk of the lifting power. 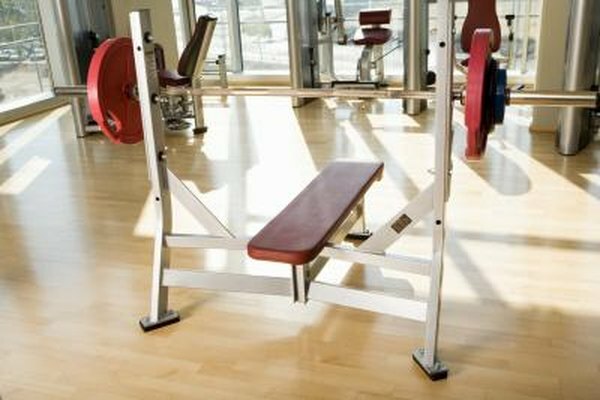 The American Council On Exercise stresses the importance of safety when performing bench presses. The organization recommends using a spotter positioned near your head, ready to assist at the beginning and end of the exercise. The spotter should also be ready to assist by grabbing the bar to reduce strain on you if you are unable to complete a repetition. Do not to bend, flex or extend your wrists at any point during the exercise. Your back and buttocks should always remain in firm contact with the bench and your feet in contact with the floor.